Non metallic inclusions (slags), branch-on through the casting process, can occur in the steel. Through an irregularity during the casting to the ingot or strand slags can be washed into the proximity of the steel surface. 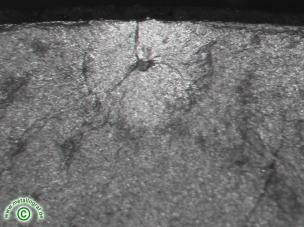 These non metallic inclusions can lead to early material breaks. In this case a helical spring is broken at the vibration test, in front of reach the minimum load. As a cause a small slag, just under the surface, could be stated. The microstructure of the spring has to be excluded as a cause or favored factor. There is existing a faultless heat treated structure without free ferrite or larger amounts of undissolved carbides.